In the coming year, may God's grace cover you, may His presence watch over you, may His love abound toward you - moment by moment, step by step, day by day. I wish you and your loved ones a Blessed, Peaceful, Joyous and Wonderful New Year! After a wonderful time spent with old friends on New Year's Eve, reminiscing and laughing as we thumbed through old photo albums, we spent New Year's Day quietly and just by our family. After a time at the beach it rained, and we headed for our favourite Borders' bookshop nearby, and our favourite seat in the Borders' cafe. It was so nice to sit with dh and reflect on the past year and the new year and share our thoughts and wishes over coffee. I won't share everything with you, but I liked what Rozanne Paxman said in the ScrapGirls newsletter, if I may quote some of her words, she said that sometimes when she compares her life with that of some interesting blog writers' , "I begin to think that I live a remarkably unremarkable life. I get up. I get dressed. I work. Sometimes, I cook. Usually I don't. On rare occasions I bake. Usually I don't. My house isn't as clean as I'd like it to be. My haircut is easy-to-do. I'm using the same makeup I've been using for years...." I had to smile because that is so me! 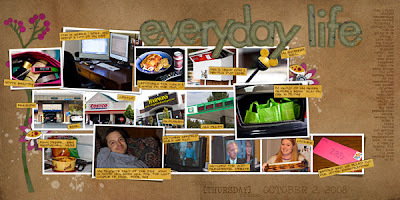 You must read all that she says, but eventually she concludes that "for now, my life is as it is and my blog proves it. I guess that's okay. It feels good here." Me too, I'm not perfect and neither is my life, but DH and I concluded that it is good, and definitely as good as it gets, and we treasure what God has blessed us with. Now I did start something yesterday! I took a lot of pictures, and at Borders I saw this fantastic book that touched the part of me that love the magazine, graphic style of photo-booking, then I went to Ikea Goddess' blog , and read about the 365 Project link she had... well one thing led to another, and I started what you see here! I'm not ambitious about taking a photo for everyday, but I will certainly like to keep going maybe every other week for 2009! This will be in simple graphic style, so I can keep it up, while I still get to be scrapbook style-creative with my Japan Travel photos! If you're interested, the 1 Jan journalling reads: We woke up really late. After all, tomorrow we start 6 am school days! The boys bought and played their once a year entitlement to a computer game (yes, they are deprived!) Jared, his Return to wonderland platinum edition, and Ryan his Avatar Bobble battles. While we watched Dan in Real Life for the second time - wonderful movie, just the way we like them! 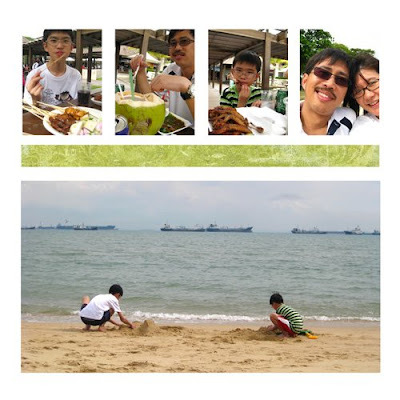 After much debating (nowadays its usually a 4 way debate ..sigh)we made it to the beach for our much missed (3 weeks in Japan followed by 1 week of rich Christmas/New Year foods) local foods - satay, chicken wings, nasi ayam, ice kachang and coconut! YUM! The boys spent time playing on the beach - we have countless similar photos of them at this same beach through the years! They never tire of it! We sat on the beach and while he read papers I caught up with the sewing of school pants for Ryan - he's so thin everything needs altering! I still have 16 name tags to sew onto both their school shirts! When it rained we escaped to Borders, and our favourite love seat in the Borders cafe. We chatted and reflected on the new year and how good we have it, how it's so "As good as it gets", and how we must treasure each day. Then a quick take-home dinner and it's off to bed for the boys at 9, while I set out their first day uniforms, shoes, the bags they had already packed. We are ready for the new year! And this is how we spent the first day. Now I would like to share with you lovely layouts from some wonderful readers and friends! This first one is by honeybee, love her Christmas morning pics! 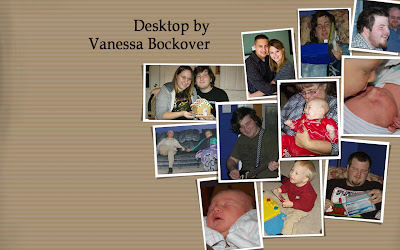 And this is what Vanessa has on her desktop showing off great family shots This is by Britney, love the theme of EverydayLife and the way she scrapped about them. Thank you so much for the freebie! I love the colors!! Your photobook is WONDERFUL! You've seen more of the US than I have ;). Wishing you and your family many blessings for 2009 and I can't wait to see the Japan pictures! Happy new year, Yin! I hope that 2009 brings you and your family tons of blessings and joys. Your Shutterfly book is wonderful. Thanks for letting us look at it. 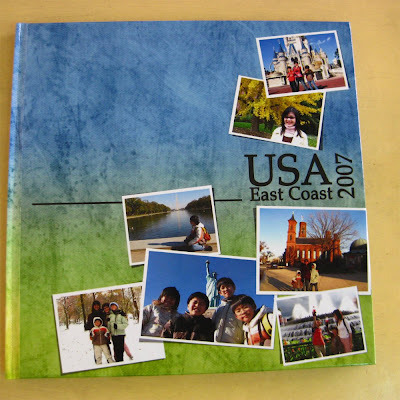 You did such an awesome job on the USA trip book! Congrats!!! Also, thank you for the freebie kit... I'm a sucker for brown and pink combo!!! 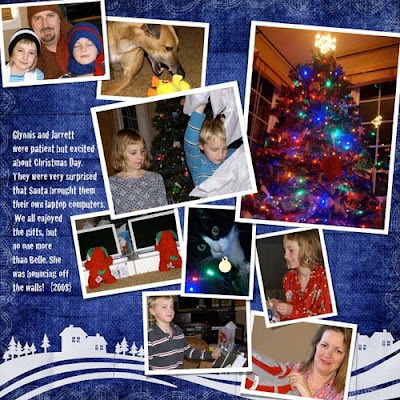 I LOVE reading your blog - thank you so much for sharing your sweet spirit with us. God is SO good! Thank you for all the templates you have shared and for the gift of this beautiful kit. May God richly bless you and your family during 2009. Your photobook is beautiful !!! Thank you for this freebie !! I love the photobook! I really like the two-page spreads. Can I ask how you do that? I'm new to this world and I love learning new techniques. Thanks, also for the freebie - it's great! I love your blog and your style! Your books are wonderful - and inspiring! Thank you for the kit! Love the colors! Blessings to you in the New Year! 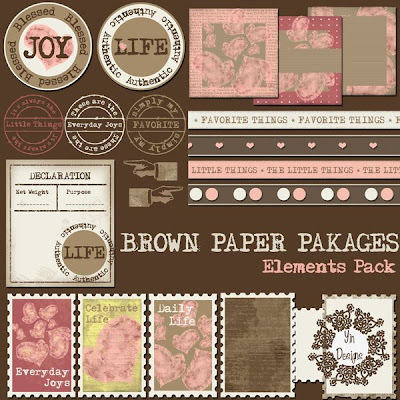 Thank you so much for not only your freebies & templates, but also for such a wonderful blog. You remind me of my mother who just unexpectedly passed away last week. She loved God and her family first and lived life to the fullest! She will be missed. Thank you again! So NOT out of date! Love this sweet kit. Thanks so much! Your blog is so sincere and inspiring. Blessings! Thank you so much for the freebies, they are super pretty! Thanks so much for the freebie! Great photobook too! I love your templates and was wondering if you could make one of your 365 project pages. I love the clean lines of it. Yin, I really LOVELOVELOVE your photobook! Your style is amazing and I think you are really talanted. Also thank you so much for your templates, they are my favourite! i love your photobook! i wish i could be creative like you! thanks for the freebie! Oh my your photobook is so wonderful. It will be treasured for years and years to come. I was wondering if you would be interested in making weekly double templates for people to use in the 365 photo project? You are such an expert at layouts it would be wonderful if you could share some templates with people like me that are not creative in that way. I am fine once I have a template and an idea but need that start. 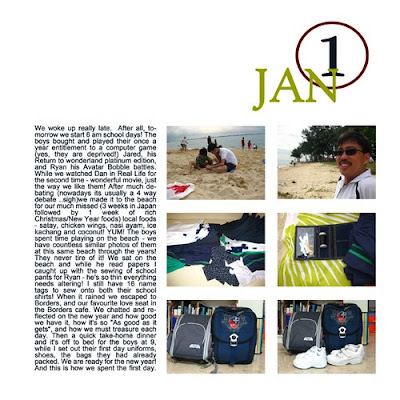 I love your layout for January 1. Is that a template that is available somewhere? All of your work is gorgeous. 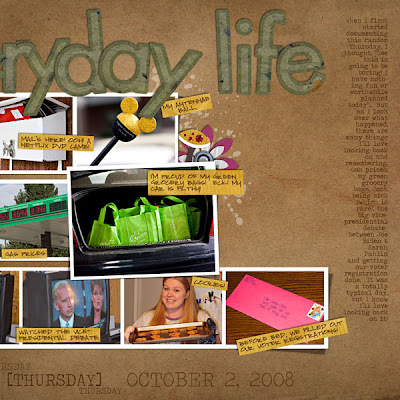 I'm new to digital scrapbooking but your work is an inspiration and your willingness to integrate your Christian faith into your work makes it so much more meaningful. Thank you for sharing your creative talent with so many friends around the world. Happy new Year to you and your family!!! I loved your album, is FANTASTIC!!!! Perfct!! Lovely! Thanks so much for this, I will take your address in my memories. Thanks so much. Thanks for sharing. 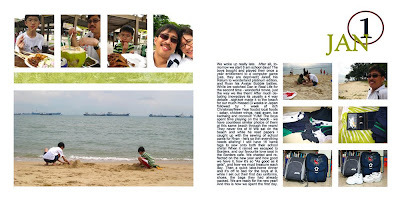 You have inspired me to get off my tush and work to create a family book of my own. this freebie is absolutly fabulous!!! Love it!!! Your photobook is absolutely beautiful! 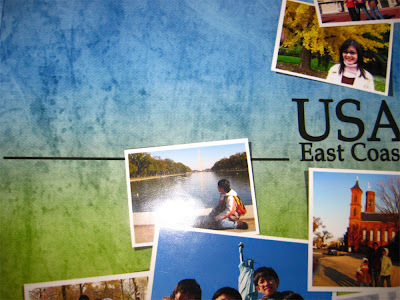 I wish I could capture the US the way that you have. I live in northern Virginia, not too far from Great Falls Park. You certainly made it look gorgeous. 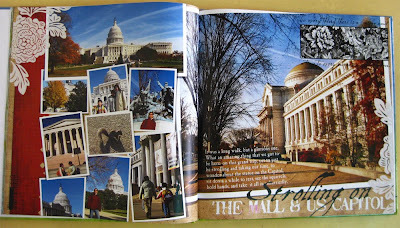 I love the Washington Monument pages too. I have joined in with the Project 365 too, except I am planning to do it on a separate blog. Love the verses you quoted in this post. Oh how I needed that scripture verse today. Thank you for that, more the the free scrapbook stuff. But thank you for that as well. Thanks for the freebie! I love the bubbly hearts! 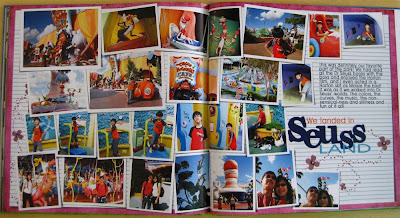 Your photo book looks amazing! 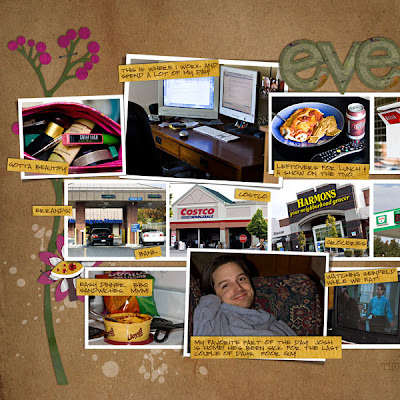 I am amazed at the inspiration of your blog...it is so nice to come across a fellow believer! Thanks for all you do to help the scrapping community. Your freebies are delightful and show your generous heart! I love your book! I was so inspired and I think you are so talented!! I love your style so much!! It's a beautiful kit. Thanks so much for sharing!!! Thanks for the wonderful paper and elements kit! "Outdated" or not, I love it!!! Your kit is wonderful..thanks for sharing Yin !! 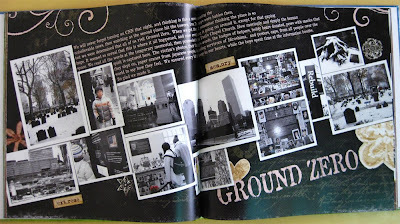 take care..
i just went to see your photo book, and all i can think of is "absolutely amazing"! You did an INCREDIBLE job on it!!! Wow! Blessings for you too! Thanks for your kit ... although there are trends ... the "personal taste" in scrapbooking is unique ... so see how many like your stuff! 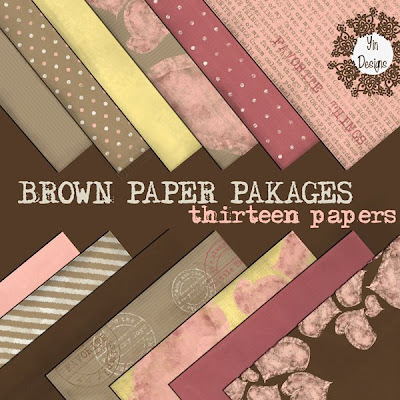 Thanks for the pretty papers! Your photobook is wunderful! I´m a fan of your templates! I love the colors in this kit!! Thank you for putting the time into it.